V-CEP Chmn. Maj. Cotten arrives at the front doorof Building 2 Walter Reed Army Medical Center. He is delivering a laundry basket containing224 Braun Pocket Shavers (small electric razors)being donated to the Soldiers Family Assistance Center(SFAC) and made possible by the hard work andgenerosity of members and patrons of the VeteransCommunity Education Partnership for West Volusia Inc.
V-CEP Chairman Maj. 'Mick' Cotten USMC Ret. 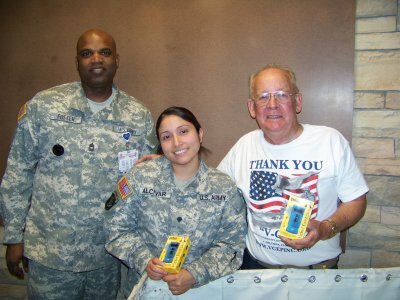 This Photo Shows MSGT Dexter Foster US Army (left), NCOIC - - at Walter ReedSPC Ivette Alcivar, US Army (center) of the Soldiers Family Assistance Center at Walter Reed, and V-CEP Chairman Mick Cotten(right) holding boxes containing the Razors.